Proves Occult Basis of Freemasonry! 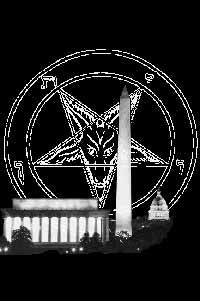 Shows How Masonry's Occult Basis Is Reflected in Washington, DC. Layout, Monuments, Sculptures, etc. 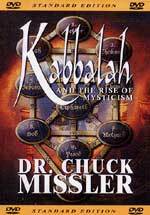 Subtitle: We shall demonstrate how occult understandings gained from reading Cutting Edge Ministries should make the prophetic truth of Part 1 even more clear. Even if a pastor has not properly applied Scripture to 20th Century events, he can learn the occult truth from Cutting Edge which will alert him to the very late stage of the prophetic hour. In Part 1, we demonstrated that pastors who do not realize that every war fought in the 20th Century has been fought to produce Antichrist -- in exact fulfillment of pertinent prophecies -- are without excuse. We further demonstrated that virtually the entire Christian leadership for the past 100 years has consistently refused to properly apply historic events to Biblical prophecy. As a result, we have a prophetically deaf and blind ministry leadership who spouts untruth from the pulpit concerning Politics and War, repeats verbatim the false propaganda of the current hour and Administration, and then refuses to see the truth when it is presented them. For some reason, pastors would rather continue to speak falsehoods than discover the truth. More horrifically, once a pastor speaks a political untruth from the pulpit that pastor is very, very reluctant to tell his people that he originally had made an error. Thus, his original error is greatly magnified. We also demonstrated in Part 1 the reality that pastors and church leaders should have known from Scripture that the world had entered into the End of the Age, and should have been alertly waiting for the next global disaster and the next war as our political leadership gradually maneuvered the nations of the world into the Kingdom of Antichrist. In this Part 2, we shall demonstrate the effectiveness of the kind of occult knowledge Cutting Edge provides that can either aid a pastor to understand trends of which he has already vaguely aware more clearly, or to see for the first time the reality that the time to the staging of the Man of Sin is very close. Cutting Edge has always filtered all occult material through Bible doctrine and prophecy to ensure we understand the events that are about to happen. Now, we shall pick up where Part 1 left off, as we discuss the spiritual battles and the spiritual assignments of both Godly angels and demonic overlords as they struggle for the heart and mind of the rulers of key nations in every era of time. Since the story of these two symbols goes much deeper, we must begin with a brief history of the demonic plan for the North American Continent almost two centuries before the American Revolution of 1776. Just as a coin has two sides, so does American history. While there can be no doubt that God's Great Awakening Revival in the North American Colonies produced a population that had many Born Again citizens, there is also no doubt that Satan began to work even earlier to effect his vision for the North American Continent. Before we study this issue, we need to go back to our Bibles, to see the relevant portion of Scripture that will enable us to see the spiritual warfare in the heavenlies that occurred centuries before this nation was created, and is occurring now! Turn with me to Daniel 10; in the interest of time and space, we will not quote the entire chapter, but shall just hit the highlights. This incredible Scripture reveals some nuggets of truth we need to understand if we are to comprehend the truth contained in the rest of this article. Nugget #1. Satan had assigned a very powerful demonic being to the King of Persia! Former Satanists confirm this Scripture, saying that Satan has assigned a Demonic Overlord to the leader of every meaningful nation on earth, in every era of time! The purpose of this National Overlord is to whisper into the ears of the king to get him to take actions that will move Satan's agenda forward. Nugget #2. Satan had already assigned a Demonic Overlord to the future king of Greece who would take Greece to her prophesied heights of power and influence -- we know from Daniel 2:32, that God decreed four Gentile World Empires, beginning with Babylon, then Medo-Persia, then Greece, and then Rome. History tells us that this is exactly what occurred. Now, Daniel received this angelic visitor at the "third year of Cyrus king of Persia" (verse 1), which was 535 B.C. (The New Analytical Bible, KJV, 1964, p. 1455). The hostile demonic Overlord of Persia was constantly at the side of Cyrus as this passage indicated; however, the angel could already see the demonic Overlord of Greece getting ready to come alongside of Alexander the Great, even though his reign did not begin until 336 B.C., fully 179 years later! Thus, we can see that Satan had assigned the demonic Overlord of Greece at least 179 years before Alexander the Great began his reign! The Bible does not state how many years Satan assigns the Overlord to individual nations, but it certainly could be a much longer period of time than just 179 years. How many years before America was officially born in 1776 had Satan assigned the demonic Overlord of the United States? One Illuminist author has an answer, which may be entirely correct! Nugget #3. The second and last matter to understand from Daniel 10:13 and 20 is that, even though the kings of Medo-Persia were being invisibly influenced by Satan's Overlord, God intervened on certain occasions to fulfill His Plan for that nation. For example, God influenced the Medo-Persian king, Artaxerxes to decree that Jerusalem would be rebuilt, thus beginning the fulfillment of Daniel 9:24-26, the most single important Messianic prophecy in the entire Bible [Read NEWS1751]. In fact, God's holy angel assigned to Artaxerxes caused him to make his proclamation precisely on the exact date it needed to be made in order for the mathematics of the prophecy to end on the day Jesus rode into Jerusalem on the donkey, being proclaimed as Messiah. The date Artaxerxes made this proclamation was March 14, 445 B.C, thus making the day Jesus was to be proclaimed Messiah April 6, 32 A.D. History records that these two events did occur exactly on this schedule! God's mathematics was thus preserved. Thus, the Godly angel prevailed over the demonic Overlord of Persia on this one issue, utilizing the omnipotent power of God. While God has the power at all times and in every instance to defeat the plans of the demonic host, He does not act in every instance to do so. In God's Omnipotence, He sometimes allows the demonic host to influence the earthly king to take actions that seem to further Satan's agenda. Of course, God's Plan will ultimately prevail; but in countless instances throughout history, God has allowed the demonic host to seemingly prevail. [Read NEWS1503 for full details]. God's major purpose at the End of the Age is for Satan and his demons to act in such a way through the leaders of mankind as to fulfill His prophecies! 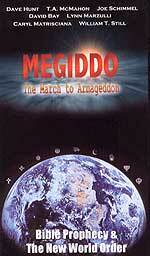 The first prophecy recorded for the Tribulation Period is found in Revelation 6:1-2, where Antichrist arises! Further, 1 Peter 1:20 tells us that the "Last Times" began with the advent of the Gospel of Jesus Christ (Adam Clarke Commentary! Therefore, it is no stretch of the imagination to believe that both God and Satan began to work to change the world so Antichrist could arise back in 1776 or before! Indeed, that is what the Illuminists are claiming, that the occult story of the United States began with Sir Francis Bacon, most probably in 1594! That is where we turn our attention to now, very briefly. SIR FRANCIS BACON -- "THE NEW ATLANTIS"
In approximately 1594, Sir Francis Bacon received a demonic vision that the North American Continent was to be established as a "New Atlantis" and that the British Crown was to make every effort to ensure that this occurred. Atlantis is that mythical kingdom which every occultist believes really existed, in which the people were so advanced in their occult knowledge and practice that they had a physical Third Eye which had opened in the middle of their foreheads. These people did not talk, for they communicated Telepathically. When an Atlantean wished to go somewhere, they simply thought where they wanted to go and they were instantly transported there. This Legend states that these people lived in peace and harmony for many years, until their leadership became corrupt and began to war against each other. Suddenly, without warning, the island nation of Atlantis blew up and rapidly disappeared under the ocean. The few people who survived supposedly landed on the coast of Europe; some went into Tibet while some traveled into what is now Germany. While they lost their physical powers and manifestations, they still retained much of the ancient knowledge of the Mysteries. Forming Secret Societies, they passed this secret knowledge down from generation to generation, yearning for the day in which the entire world would be initiated into this Atlantean Mysteries Religion, with a spiritual superman -- The Christ -- having arisen to take control. The Bible will call this man "Antichrist". The demonic vision given to Sir Francis Bacon stated that the time had arrived for the world to begin the trek that would culminate in "The Christ" ruling supremely over the entire earth. However, many enormous obstacles must be overcome for the peoples of the world to be ready to unite in a Global Government, Economy and Religion. Further, the demonic Guiding Spirit of Bacon told him that Lucifer had chosen the North American Continent to provide that leadership. The British Crown was to ensure that every effort was expended to ensure that the Colonies as they were to become known, were established as an occult nation whose leaders were part of the "Illumined Ones" and would gradually lead the nations of the world into the Kingdom of Antichrist, a.k.a., the New World Order. To what prophecy of Bacon was van Buren referring to, above? 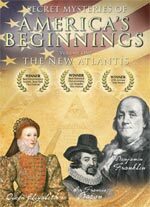 In 1627, Bacon's book entitled, "The New Atlantis" was released by his friend one year after Bacon had died. 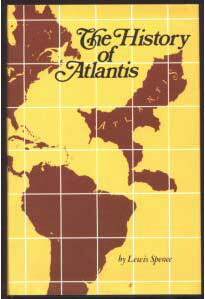 This book set forth his vision for North America to be the New Atlantis. All the while, the British Crown was taking official action to ensure that North America would become the United States of America, so she could begin to fulfill her demonic destiny. Thus, when the colonies numbered exactly 13, Adam Weishaupt founded his Masters of the Illuminati (May 1, 1776, during the Beltaine period of April 30 - May 1). Precisely 66 days after that particular April 30, the fledgling United States of America announced her independence from Great Britain. The interval between June 21 (Summer Solstice) and July 4 was also 13 days. The flag that van Buren referred to was the 13-star and 13-stripe American flag. The stars were all upright White Magic Pentagrams while the 13 stripes alternated white and red. In fact, the numbering of the alternating stripes speaks to Satanic esoteric meaning. You see, an occultist believes that the number, "6" means "Man", while the number "7" means "Perfection". When a man becomes a Mason, he is struggling and working upward to become "Perfected Man". Thus, by adding the number of Man -- 6 -- to the number of "Perfection" -- 7 -- you will get the number of the Masonically-produced "Perfected Man", the number 13. Of course, this is Satan's number of extreme rebellion against the God of the Bible. When Christian churches proudly display the US Flag, they are displaying the number "13", extreme rebellion against God! Now, the blue area is chock full of 50 White Magic Pentagrams. A Pentagram is the most evil symbol of the occult, except for the hexagram. While most Americans feel that a Pentagram with one star upward is just a simple star, they do not realize they feel this way because of 229 years of incessant propaganda. Satanists laugh at Christians for their naiveté, and they love having infiltrated nearly every Christian Church in America with this flag full of Pentagrams and the 13 alternating stripes. Do you have the courage to look at the truth and accept it. Before we get to our examination of the Illuminist Great Seals on the back of the American One Dollar Bill, let us examine yet another piece of damning evidence of America's Satanic government. 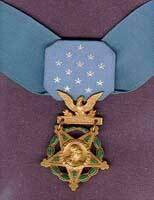 Please take a critical, close look of this Congressional Medal of Honor. You will notice that the shape of it is another type of Pentagram, the most hideous known as the "Goatshead of Mendes", with two points up and one down. This type of Pentagram is a Black Magick star and is meant to denote that an evil purpose is planned! * free13 -- "Freemasonry Proven To Worship Lucifer, Part 1"
* NEWS1487 -- "Our Founding Fathers Continually Dedicated America To Satan From 1791 to the late 1890's"
* NEWS1601 -- "Satanic Goatshead of Mendes Used In Baptist Church Bulletin"! We encourage you to read these articles carefully, so you may understand how terribly Satanic and evil this type of Pentagram is, for then you will begin to understand the true nature of our government. Since the Congressional Medal of Honor was created in 1861 to commemorate exceptional bravery of soldiers in combat, it has been given to over 3,400 very brave men. However, the story these medals present to anyone familiar with the occult is identical to the meaning the symbols on the back of our One Dollar Bill -- all three symbols indicate that our government since 1776 has been gradually moving the world into the New World Order -- Kingdom of Antichrist -- and all wars fought have been waged for the express purpose of staging Antichrist! The meaning is all there, for anyone with the intellectual honesty to admit it. Yet, we know of Christian Churches who actually have Congressional Medal of Honors hanging in their lobby! The Bible teaches that ignorance is to be no excuse on the Day of Judgment, so every pastor needs to carefully examine his own heart before the Holy Spirit to see if they can continue to display the symbols of this Illuminist government in their churches! Now, let us get to the most important symbols -- the two Illuminist Great Seals on the back of our One Dollar Bill. Remember, each One Dollar Bill is an official document of the United States of America. Thus, their very presence on the back of our dollar means that the current government is fully in sync with the meaning of this symbol. And that includes President George W. Bush! The best and fastest way for you to realize the depth of the commitment to the New World Order, is just turn your $1 bill over on the back and look at the Masonic pyramid with the All-Seeing Eye at the top. 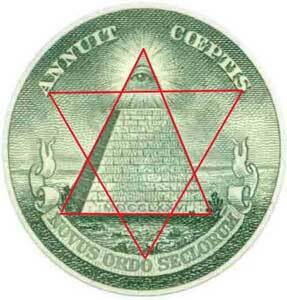 The words toward the bottom, "NOVUS ORDO SECLORUM" translate into "New World Order". This symbol was voted into being by the Continental Congress in 1787, in secret session, attending mostly by Freemasons. However, this symbol was hidden from the public until 1935, when 33rd Degree Mason, President Franklin Roosevelt, was told by his Secretary of Agriculture, Henry Wallace, that the Guiding Spirits had told him that now was the time to bring this symbol into public. Just as this Illuminist symbol on the back of your One Dollar Bill indicates, the Illuminati has been pursuing the establishment of the New World Order -- NOVUS ORDO SECLORUM -- since 1776, the year inscribed in Roman Numerals on the bottom row of this Satanic Mysteries pyramid. The New World Order is a secret society term that literally means, "The Kingdom of the New Age Masonic Christ". The words "Annuit Coeptis" means, "Announcing The Birth Of"; so, the Masters of the Illuminati announced the birth of the New World Order on May 1, 1776, and charged the American Government with its gradual implementation! Since this One Dollar Bill is an official government document, we know for a fact that our government has consistently been committed to achieving the Kingdom of Antichrist since 1776 -- President Abraham Lincoln possible excepted. Truly was Jesus absolutely correct when He said the appearance of Antichrist would be the result of terrible "birth sorrows" - Matthew 24:8! The Illuminati chose to depict their New World Order as a "birth"!! But, there is yet more horror in this symbol! Hidden symbols are extremely important to the occultist. A hidden symbol becomes a "Magical Symbol" capable of great power. As explained in the book , "Magic Symbols" -- "The true magic symbol is an image which hides an inner meaning". In other words, power is generated when the uninitiated cannot grasp the hidden symbolic meaning. Occultists have believed for centuries that their very secrecy gives them immense power. However, this hexagram is surrounded by a circle, making it a demon trap. Hexagrams are also known as "Demon Traps" when they are surrounded with a circle. When a witch wants to conjure a demon she draws a 9-foot circle on the ground. Then she draws a hexagram inside. Then by pronouncing the proper formulas she can force a demon to appear within the circle. As long as she stays inside the circle the demon cannot not hurt her and must do her bidding. If the witch stepped one foot outside the protective circle the demon would kill her. Demon traps are used to advance the cause which the witch wants to advance. A witch can use it to conjure up a demon to work on behalf of the United States of America to achieve the New World Order. Thus, this symbol has a hidden demon trap built into it, making it a most powerful symbol working on behalf of the United States. Not only will the U.S. Illuminist government possess overwhelming occult power, she is demonically protected from being hurt by any outside force -- until the planned time of our demise! Note that the capstone of this pyramid is not in place, thus denoting an unfinished situation. This unfinished situation was planned to remain in effect until the Old World Order was destroyed and replaced with The New World Order. In other words, this pyramid can only be capped once Antichrist is on the world scene, displaying his full Satanic power as revealed in his "lying signs and wonders". Thus, a Satanist will see a "777" in "MDCCLXXVI" - A triplicity of any number symbolically heightens that number to the highest degree possible in Black Magick Witchcraft. ** And, of course, 3 x 7 = 21 also a very magic number. The year, 1776, when added, totals 21 also, making 1776 a very powerful magical year. But, when you divide 21 by three, you again get three groups of 7, i.e., 7 + 7 + 7, a meaning of extreme Perfection! The Kingdom of Antichrist is conceived to be the ultimate Utopia on earth, as mankind can finally cast off all of the hated restraints imposed in the Bible! On May 1, 1776, a New World Order was born, whose foundation would be built upon depravity and rebellion. Its leader would be Satan. Its goal is then, and still is today, the staging of Antichrist. The year, 1776, is the Beginning year in which man is placed above God through exceeding "sinfulness of sin". Man (represented by # 6) is going to create his own new Beginning and his perfect 1,000-year reign of "The Christ". This is the testimony of the Masters of the Illuminati, fully represented by Seal #1, the unfinished pyramid with the Eye of Lucifer hovering atop. But there is still more horror in this symbol! Former Black Magick Satanist, Doc Marquis, in his book, "Secrets of the Illuminati", has drawn this Great illustration of the New World Order, depicting the various influences and organizations actively involved in the drive to the New World Order. This illustration is part of the Satanic "Oral Tradition" taught to Adepts who are learning the true, hidden plan to produce Antichrist. Let us begin at the top in examining this symbol. * The All-Seeing Eye atop the page, looking down on all the activity being carried out on his behalf, is Satan, depicted as the Eye of Horus. * The word, "I" depicts the extremely self-centered, self-proclaimed wise and righteous man who is working mightily for Lord Satan to achieve this new system. This man is the Perfected Man, formed through Masonic ritual and doctrine. The number of this Perfected Man -- soon to become god -- is "13" - "6" + "7"
"Witch" is extremely important, because the New World Order will be achieved only on the basis of powerful witchcraft, practiced in many different forms and by millions of people during the past two centuries. Witchcraft is nothing more nor less than the worship of Satan. But, the Illuminati practices the most powerful Witchcraft the earth has ever seen! 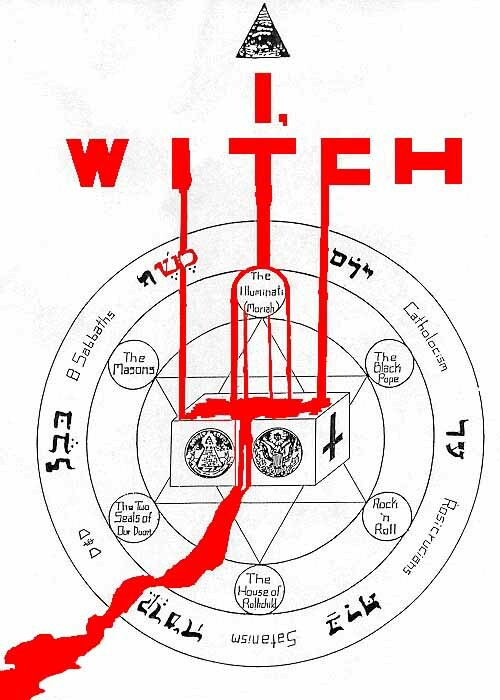 Out of the "I T C" of "Witch" flows lines that are blood red, depicting the human blood which has already flowed and the human blood which is planned to flow, in order that this system might be established. Notice that this blood flows on top of and around The Illuminati. All three blood flows pour upon the Satanic altar and off the Seal into the world. The Illuminati has long recognized that Antichrist can only be produced by a huge slaughter of human sacrifices. Wars count as human sacrifices, as do revolutions, genocides, and yes, especially Abortions! This symbol reinforces the truth, stated above, that all wars fought in the 20th Century were fought to produce Antichrist! Every single one! The planned Third World War [Read NEWS1056 to learn about the demonic vision of 1870 that three world wars would be necessary to produce Antichrist] will produce more slaughter in a shorter period of time than has ever been seen in the history of mankind. Out of the smoke, debris, and death of World War III will stride Antichrist. Where will this World War III be started? In the Middle East, with Iraq as the trigger war! Now, look at the Satanic Altar upon which all this blood is flowing. The first meaning is that all this human blood sacrifice is dedicated to Lord Satan. The second meaning can be found by examining the two seals on the altar, identical to the seals on the back on the One Dollar Bill. At this moment, you need to put your thinking cap on. These seals may be on the official document known as the One Dollar Bill, but they are found on no official letterhead of the United States Government! 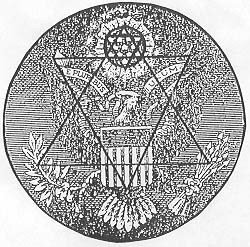 Therefore, they are not really official seals of this government, but of the Illuminati; these seals on this Satanic Altar demonstrate that the U.S. Government serves Masters of the Illuminati! But, then, you must stop to realize that these two seals appear on no other government documents in the world! They appear only on the United States One Dollar Bill. From this fact, you must understand that America was truly "Chosen" by Satan to lead the world into the Kingdom of Antichrist -- New World Order. The outer circle has many organizations which are striving mightily and cooperatively for the New World Order. We shall not describe them here with all the meanings because this article has already run out of room; however, we do thoroughly discuss these symbols in Seminar 2, "America Determines The Flow of History". Now, we need to take a quick look at the other Great Seal, the Eagle symbol on the right hand side of the One Dollar Bill. The smaller hexagram is formed within the circle containing the 13 stars. In each hexagram, the pinnacle is formed by the single star, both top and bottom. In each hexagram, the two outer points are formed by the outer star formed by the 4-star line. The circle surrounding the hexagram is formed by the design of the 28 shield guide-lines. Experts have argued for decades about why the stars were formed in this most unusual manner, with no author knowing the precise reason. Now we know why this unusual arrangement was selected. Thus, we have two hidden, embedded hexagrams surrounded by the necessary circle to create two demon traps. From the beginning of our country, witches could consistently conjure up demons on behalf of the United States of America to work for the New World Order. These two symbols on our Dollar Bill thus have three (3) demon traps built into the design; the number, "3" is the number of the pagan trinity -- Satan, Antichrist, and the False Prophet. But, there is even more hidden embeds within these two symbols: Each hexagram has six (6) points; therefore, since these two Great Seals contain three hexagrams, we have the Satanic number, '666', created. Now you can easily see how brilliantly these two Great Seals were created. Clearly, their authorship had to be demonically supernatural, since they are outside the boundary of human ability or comprehension. Indeed, Doc Marquis state firmly that the design of these seals were delivered by a supernatural demonic being who appeared to Thomas Jefferson, handed him a bag with the seals already created, and then disappeared into thin air! Elizabeth van Burn, in her book quoted above, states that supernatural assistance was given to create these designs, although she does not give the detail Marquis provides. However, rest assured in the authority of Scripture as revealed in Daniel 10, the demonic host was very involved in the original creation of this country and its symbols and its occult plan. As the world was beginning to head into the final centuries before Antichrist would arise, Godly angels allowed the demonic host to successfully seize control over the leadership of the new American nation, and implement their symbols and their imprimatur, even though they had to initially hide their work. As we have stated before, in 1935, the Guiding Spirit of President Franklin D. Roosevelt (33° Mason) and Agriculture Secretary Wallace told them that the time had arrived to make the unfinished pyramid Great Seal public, because the American people were sufficiently removed from Christian values and training that they would not recognize the symbol as Egyptian Mysteries; further, the Guiding Spirits told these men that, from this point onward, their success was guaranteed! The planned Third World War was just 4 more years away! In the next article, we shall demonstrate that, according to the finest thought in the Dialectic Struggle, the Illuminati raised up their enemy -- Adolf Hitler -- so they could war against him and move the world just that much closer to Antichrist [Read NEWS1056 to see demonic vision as how to produce Antichrist]. 1. In 1776, the Illuminati was sick and tired of being slaughtered by the Pope and his kings in Europe and Great Britain. Starting in 600 A.D., the Vatican began to persecute, torture, and slaughter the Black Magick Hermetic Philosophers of Europe ["The Magic of Obelisks", by Peter Thompson, p. 81]. This slaughter was so horrific that the Black Magick movement was greatly stymied. The Guiding Spirits of our Founding Fathers told them that, if this type of government persecution could be forbidden in this country, then over a period of time, the values and attitudes of the Black Magick Illuminati would begin to force Christianity into retreat, and would begin to percolate through the citizenry. One only has to look at the phenomenal success of Satanic Rock Music and the love of Satanism and horror in our country today to see how correct the Guiding Spirits were. On the Christian side in 1776, fundamentalists were also sick and tired of being persecuted and slaughtered in Great Britain and in Europe by kings acting under orders of the Vatican. They wanted a government that would be forbidden by a Constitution and a separation of powers to persecute and slaughter on the basis of religious persuasion. Therefore, an alliance began to form between the Illuminists and the Fundamentalist Christian that you will never see again, as both parties worked together to achieve the same goal -- a limited Constitutional, divided government. 2. If the United States of America was to lead the world into the New World Order, their government had to be attractive to the masses of people in foreign lands. If our government was as repressive as it was in Europe and England in the Middle Ages, no one would be attracted to our form of government and no one would accept our leadership. However, if people in foreign lands viewed America as the land of opportunity and golden hopes, they would be more likely to accept our leadership as we gradually led the world into the New World Order. As this process is getting close to an end, you will see America cast into an ever-increasing bad light. Demonically Protected As The "Chosen One"
One point needs to be strongly reiterated here: from 1776 onward, the United States of America was fulfilling her role as the "Chosen One" by Satan; he threw a mantle of protection around this country to protect her from all enemies, foreign and domestic, in order that she could completely fulfill her role of leading the world into his global kingdom. Our occult presidents have firmly understood this reality. They have further understood that, when they planned wars, including the three planned world wars, our demonic protection would prevent us from being destroyed. When we study the audacity of the American Illuminati from 1920-1945 in financially building up Adolf Hitler so he could be the fearsome enemy against which we would battle, bear in mind that our leaders were constantly reassured by their Guiding Spirits that we would not be destroyed. This understanding is fully consistent with the revelations of demonic influence in the life of key nations as revealed in Daniel 10. At this point, we need to reiterate the omnipotent power of Almighty God. We do not want to seem to be giving full credit to Satan for America's success and longevity. Certainly, God's hand of blessing and protection has been on America since 1776, because of the righteousness of the Born Again Christians who have lived and labored in this wonderful land. God's hedge of protection has certainly been around this nation. But, within Satan's chaotic kingdom, he does maintain a certain order when it serves his interests, and that interest was to use America as a tool to gradually -- over an acknowledged period of more than 200 years -- move the nations of the world into the Kingdom of Antichrist. Thus, not even the powerful demons of Adolf Hitler were allowed to touch Satan's really "Chosen Nation", America. When America's demise comes, it will be because God is judging her mightily; however, God is likely to use another nation to deliver His final judgment, just as he used Babylon to judge Israel. At that moment, God's timing through His prophecies will decree that America's time of destruction is here, whether Satan is ready or not. However, we know from Daniel 7:7-8 that the three super nations are not destroyed until Antichrist is on the world scene; therefore, Satan's use of America will be finished, as well. Aside from the two "Seals of Our Doom" on the back of our One Dollar Bill, there are other Satanic symbols that are boldly on display in our nation. If Christians were aware of the devil's "devices" as was the Apostle Paul, our leaders would never have been able to erect these symbols from the Egyptian Mysteries, Babylonian Mysteries, Baal Worship and Baphomet idolatry. Since we have covered this subject in many previous articles, we shall just point you to these articles so you can go read them. A. Obelisk -- Washington Monument, 555 feet high, 111 feet deep, for a combined height of 666 feet! Other facts about this monument are also expressed in occult sacred numbers. * NEWS1081 - "Freemasonry Source Confirms That Government Center Was Created In 1792 As A Capitol Dedicated To Masonry"
Show the original Washington, D.C., street map drawn in 1792 by French Freemason Pierre Charles L'Enfante, which clearly shows the street design we report in NEWS1040. This map demonstrates that the original 1792 street layout plan was to create these Satanic symbols on the ground; even though the actual construction took almost 100 years to fully complete, the original design is now apparent. * NEWS1399 - Former Satanist Informs Us That Government Mall In Washington, D.C., Is Laid Out In Shape of the Satanic 'Sephiroth Tree of Life' -- The Sephiroth depicts the occult concept of the creation of this world, as well as other worlds they believe exist. Our occult Founding Fathers would want IT to be the symbol of Government Center of their New Atlantis! The Sephiroth Tree of Life , the Archetypal Man depiction, was used as the inspiration of the Masonic Coffin. By placing a Mason in a coffin shaped like the Sephiroth Tree of Life, Freemasonry is depicting Eternal Life for that Mason, thus demonstrating their belief that the Perfected Mason -- Perfected by Masonic rituals and Good Works -- would enter into eternal life. However, The Mall was created in a form that strongly resembles Death in the form of the Masonic Coffin. You see, Masons have also used another symbol of Death to represent the United States. Did you know that our American Eagle was originally depicted as a Phoenix Bird [Doc Marquis, former Black Magick Satanist]. The Phoenix Bird is an Egyptian mythological bird that reportedly lived for 500 years; when it came time to die, the Phoenix Bird would cause its own immolation. The dying bird would catch on fire, and would burn completely to a pile of ashes. Suddenly, a new Phoenix Bird would form out of the ashes and fly away. Literally, the new Phoenix Bird is formed out of the ashes of the old. 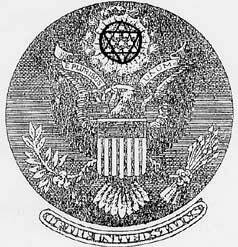 Occultists have always viewed the United States as a Phoenix Bird. After leading the world into the doorway of the New World Order Kingdom of Antichrist, is their plan that we would self-immolate, burst into flames and be reduced to a pile of ashes? However, out of the pile of ashes another Phoenix Bird would arise, a global Kingdom of The Christ, this time! We believe key, inner-circle Founding Fathers understood this occult plan perfectly, that the United States would be called upon to die at the very end of the cycle to produce Antichrist, and out of our ashes the truly global New World Order would arise. We seem to be drawing perilously close to this final occult plan for us: immolation in fire that will destroy America completely. * NEWS1493 -- "Washington, D.C., Planned by Our Masonic Forefathers To Be The Most Powerful Occult Capitol In World History". - Satanists believe that a city must be built by the Serpents of Wisdom and continually receive Serpent spiritual power if that city is ever to be great. Masonic American Forefathers built Washington, D.C., to be THE capitol in world history, unparalleled in occult power and influence. The Serpent symbols in our Federal Mall tell the story! In summary, our Masonic and Rosicrucian forefathers placed these symbols on the ground in Washington, D.C., and elsewhere, they believed they were creating numerous 24-hour a day centers of throbbing occult power that would invisibly, continually lead America into fulfilling her demonic role in world affairs. You see, occultists believe that, once a symbol is created, whether on paper or on the ground, it takes on a life of its own, and begins to literally pulsate with Satanic energy. They further believe that symbols are transfer points of occult power from the demonic realm to this dimension. Thus, it is highly significant that we have so many Satanic symbols scattered throughout this nation. They tell the story we have been trying to teach in this article, i.e., that America's leadership was originally very Satanic, and that a Demonic Overlord came alongside American leaders no later than 1776 and probably well before. This Overlord was functioning in the same mold as the "hostile Prince of Persia" in Daniel 10. We ignore the story these symbols tell to our great peril as Christians; yet, most pastors today ignorantly dismiss them is irrelevant! We have demonstrated two strong realities in this article thus far. 1. Christian pastors and teachers are without excuse in their ignorance as to current world events and leaders because they should have known the "Time of Visitation" by applying End of the Age prophecies to global world events during the past 100 years. 2. Satanic symbols and a knowledge of the "devil's devices" provided by ministries like Cutting Edge should alert all Christian pastors to the reality that America has been leading the nations of the world into the Kingdom of Antichrist since the 1776 date on the back of every American One Dollar Bill in circulation! * All of America's wars are just -- With the exception of possibly Abraham Lincoln, all presidents have followed the New World Order Plan. Certainly, all presidents of the 20th Century were Illuminist through and through. All American wars of the 20th Century were fought to establish Antichrist. Therefore, when Christian pastors encourage hyper-patriotism, they are committing twin evils: First, they are encouraging their flock to feel greater loyalty to an Illuminist President and his government than they should. Secondly, such hyper-patriotism is encouraging Born Again young people to run off to join a military that is fighting to establish Antichrist! I love this country, and proved it when I joined U.S. Army Intelligence for 4 years in 1968, even though I knew by that time that we were not trying to win the Vietnam war. My love for this country stems also from the freedoms I have enjoyed and continue to enjoy, including the freedom to worship. However, I am discerning enough to know exactly why we have these freedoms, as explained above. American Christians need to be intelligent, discerning patriots, not the lemming kind that follow a charismatic leader over the cliff using patriotism as a tool. Most pastors who use this hyper-patriotism as a tool see it as a means by which to build the numbers in his pews. Patriotism is a strong emotion and can be very effective in bringing people to your services, especially if the church has a military base close by. But, patriotism during this End of the Age is too important an issue to be used simply as a tool to build attendance numbers! * Americans have their freedoms only because of the bravery of our fighting soldiers. While I certainly do not want to detract one iota from the true bravery of our soldiers, this statement is absolutely untrue, as we have noted above. In actions fully consistent with the understandings provided by Daniel 10, the Demonic Overlord of America has shielded this country from all enemies so her "Manifest Destiny" could be fulfilled. Now, after Antichrist has arisen, that demonic shield will likely come down. Maybe that is why we see, in Daniel 7:7-8 that, after Antichrist arises, three of the original super 10 nations are totally plucked up and destroyed. In fact, a former Satanist reveals that her Illuminist father often told her that, when she saw Antichrist appear on the world scene, she had 12 days to get out of the country, for on Day 13, America was going to be destroyed by fire. One matter we did not mention: From December 31, 1992 to the end of 1996, the prophesied 10-nation global reorganization did occur! NAFTA was Nation #1 and Western Europe was Nation #2 in that reorganization plan! [Read NEWS1703 for full details]. While most American Christians and their pastors were completely asleep at the switch, the Illuminati reorganized the entire world into 10 Super Nations. This reorganization was quietly accomplished as economic nations, because of the realization that initial resistance to economic creation would be far less severe than political reorganization; NEWS1703 explains this scenario exactly. Therefore, it IS later than you think, is it not? We have written another article on this subject, NEWS1783, "Trembling Between Two Prophecies". Maybe it is important, after all, to pay attention to world affairs, looking at them through the eyes of Bible doctrine and prophecy, don't you think? Throughout all this, we need to make a couple of things very clear. 1. We are NOT advocating any resistance to this Illuminist government. We realize the Biblical injunction that we are to obey those in authority over us [Romans 13:1-7; Titus 3:1], and we are equally aware that this command was given to a people who were laboring under the most most occult government in world history, the Caesar's! 2. Even though I served honorably during the Vietnam War, the only way in which I would fight now is if I were drafted. 3. To those Christian young men who are currently in our armed forces, I would encourage you to do your duty and obey your orders, unless you are ordered to do something you know is against Biblical commands and international law, i.e., deliberate slaughter of innocents. However, knowing what you know now, I would encourage you to think carefully and diligently about whether you want to stay in once your initial enlistment is finished. Now, when Christian pastors preach faithfully from the Bible and sing traditional Christian hymns, but praise George Bush and regurgitate the propaganda fed us about a "Just War" in Iraq against that "madman" Hussein armed with those mythical Weapons of Mass Destruction, what difference is there between this type of church and the "coerced" churches of Nazi Germany? Finally, we need to thoroughly understand what Jesus taught about the unparalleled political and spiritual deception at the End of the Age. Thus, what Jesus is truly saying is startling in light of our current situation. Our precious Savior is saying, "For there shall arise false political leaders, and false religious leaders .... if it were possible, they shall deceive the very elect." Sadly, too many genuinely Born Again Christians are completely deceived about President George W. Bush and his Illuminist wars he is waging so Antichrist can arise. They are so deceived because they are relying too much on pastors and teachers who are willfully blind. But, now, you know the truth, and it shall set you free! Today is the day when genuine pastors need to make sure they are leading Biblical churches, and not a combination of Biblical and worldly churches. Pastors today need to be Biblical in all things they do, and not be a Newly-Coerced Church! Truly, the End of the Age is spiraling toward conclusion.